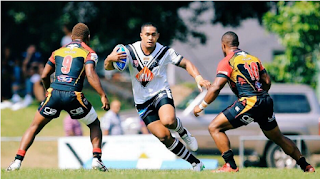 SP Hunters coach Michael Marum has put his 52 man train- on squad through one of the toughest pre- season training programs since camp started last Sunday in Port Moresby. The squad includes 25 former and current players, 25 new players plus two from the Southern Academy. The respected coach said the pre- season program was six weeks behind schedule and he had only three weeks to put his charges through fitness tests. “There’s only 12 weeks to go from today before the 2017 Intrust Super Cup season kicks off and we have had to put the train on squad through some very intense training. “Three weeks is not enough but this has been due to circumstances beyond our control. This week has showed if these players continued training on their own,” he said. Marum revealed that seven players were released during week one for various reasons. “Co- captain Noel Zeming has withdrawn to concentrate on his career. Stanley Olo and Bradley Yano failed to pass medical tests on injured ankle and arm respectively. Tuvi Lepan failed to arrive in Port Moresby after missing his flight while Bernard Goma was late to arrive in camp on Sunday. “Timothy Lomai and Warren Glare were released following tests that their fitness levels were not up to the required standard,” he added. “I have spoken to these players and they have accepted it,” he added. Marum said the remaining 45 players will continue to be put through the rigorous training program and their fitness levels monitored. “We will spend another week in Port Moresby and travel to Goroka next Saturday December 17 until December 23 when we will break for the Christmas and New Year period,” Marum said. “While in Goroka, the squad will be joined by the Highlands Academy and selected Highlands and Northern women players. The Digicel Cup franchise trainers and coaches will also be in attendance,” he said. The SP Hunters train on squad travel home on December 23 to spend the Christmas period with their families and return to camp on January 2, 2017. The final 30 man squad and staff to take part in the 2017 Intrust Super Cup season will be announced a week or so later. On behalf of the SP Hunters staff, players and our families, I thank you all for all your support during 2016 and wish you all a very merry Christmas and prosperous New Year.